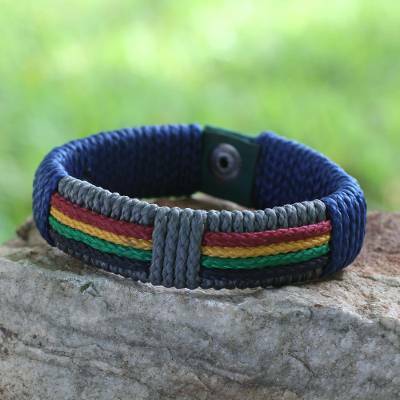 Men's Wristband Bracelet, "Traditions of Africa"
Rich colors pay tribute to African tradition as Robert Aidoo-Taylor crafts a trendy wristband for men. The bracelet features cords wrapped around compressed recycled paper. You can find men's wristband bracelet 'Traditions of Africa' by Robert Aidoo-Taylor in jewelry categories such as Eco-Friendly Bracelets, No Stone Bracelets, Brass Bracelets and Wristband Bracelets. Enjoy exploring these sections for other Novica treasures.